If you give regularly to nonprofits, ministries or charities, you may have heard of a Donor-Advised Fund. This philanthropic fund allows donors to make charitable contributions and grants from the fund over time. Think of it as a charitable checking account: contribute anytime and get your tax deduction now, then donate when the time is right. Donor-Advised Funds can help streamline your philanthropy — and make the most of the gifts you give. One reason a Donor-Advised Fund (DAF) is so appealing is the tax ramifications: contributions into the fund are immediately tax-deductible charitable gifts, but the balance does not need to be distributed out to the charity until you’re ready. And cash is only the beginning. You can contribute all types of assets, including stocks and real estate. A DAF can be a good alternative to a private foundation: with fewer administrative and overhead costs, it is usually less expensive. Donor-Advised Funds are typically housed at a public foundation, like the National Christian Foundation, who legally owns the assets until the donor advises which charities to grant to. Though these funds have been around since the 1930s, the last 10 years have seen an explosion in DAF growth. They’re now the fastest growing philanthropic tool being used in the United States, totaling over $22 billion as of 2015. Donors receive deductions immediately upon making a contribution to the fund, regardless of when the gift is made to charity. This allows time to carefully consider where to send a gift, rather than rushing to donate on December 31. Want to make a larger gift later? A DAF allows you to make smaller contributions over time and give when you’re ready. Doing all your philanthropic giving through your DAF minimizes paperwork. Because your giving is consolidated, you’ll get just one tax receipt at year-end. Regardless of how many charities you grant to, you only deduct what goes into your fund, simplifying the tax process. When gifting appreciated assets through a DAF, you get more than just a charitable deduction. You also steer clear of the capital gains taxes that would have been triggered if the asset had been sold first! Donor-Advised Funds streamline your giving from taxable investments, including brokerage accounts, real estate or even shares of a privately-held business. Many major donors appreciate anonymity, but it’s hard to stay completely incognito when writing checks directly to a nonprofit. Donor-Advised Funds offer the option to send checks anonymously, offering total privacy. Many nonprofits value regular, strategic giving because it allows them to plan. If you support a nonprofit on an ongoing basis, a DAF can automatically send monthly or quarterly amounts. Most foundations make the gift reporting process easy. Many people build up a balance in their DAF during seasons of exceptionally high income or after receiving a windfall from an inheritance or the sale of an asset. But if they’d prefer to give the money later, foundations allow the funds to be invested in the meantime. The funds can grow tax-free until it’s time to donate. If you’d like to instill generosity in children or grandchildren, a Donor Advised Fund can help. By setting aside a dedicated giving account, many families find it easier to get kids and grandkids involved in giving discussions. This can be a launchpad for other important conversations about how to make an impact as a family. A DAF makes testamentary giving easy: the fund can be named the charitable beneficiary on life insurance policies, wills, trusts, retirement accounts and more. 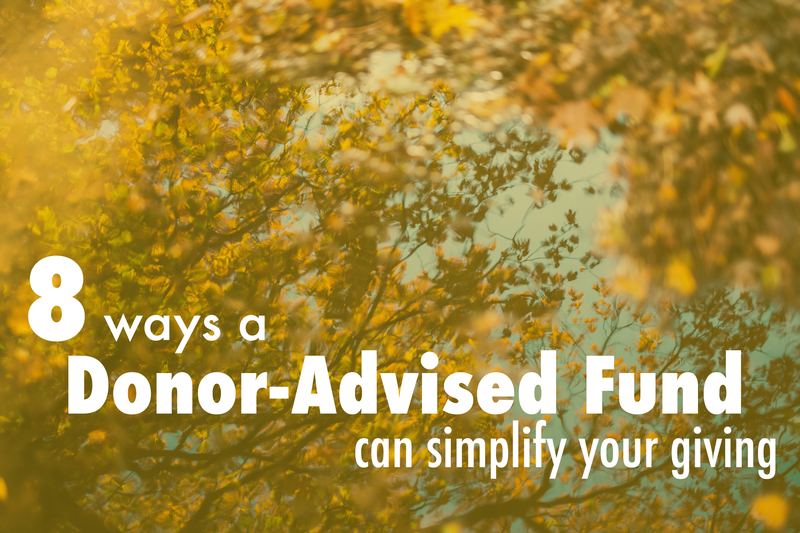 If decisions change about where to send charitable gifts after death, there is no need for a costly will revision; it’s simple to update the Donor-Advised Fund instructions (often an online setting). So, is a Donor-Advised Fund right for you? Individual tax situations vary, so it’s important to seek tax advice from an advisor specific to you. Generally speaking, DAFs are usually a good option for those giving $10,000 or more a year. Donors with appreciated assets are also good candidates. Business owners in particular will appreciate the flexibility to time the deductions. And donors who want to make gifts at the time of their death (a large insurance policy, for example) can also benefit from naming a Donor-Advised Fund as a beneficiary or heir. Because all gifts to a DAF are irrevocable and non-refundable, find a trustworthy foundation to partner with. Once deposited, charitable dollars can only be sent to IRS qualified charities or churches, and different foundations often impose their own restrictions. It’s important for you, the donor, to identify a foundation and a nonprofit that shares your values. Ultimately, a Donor-Advised Fund can help you simplify your giving and maximize your impact on the causes you care about most. If you’re looking for advisors with experience in charitable giving, Sound Stewardship can help. Contact us today to talk about how we can support your family’s philanthropy.